Least appreciated event in African-American history? Home→Civil Rights→Least appreciated event in African-American history? August 21, 1831 seldom receives much national publicity. The date seldom triggers responses from even ardent students of antebellum history the way April 15, June 6, and November 22 awakens the memories of U.S. History fans. Even among followers of African-Americans history and those who keep alive the messages from the long civil rights struggle, the date of Nat Turner’s bloody slave revolt often passes with no recognition despite the staggering ripple effect triggered by news of the killings. This month, I invite readers to understand, to reflect upon and to discuss the implications of this grossly under-appreciated historic milestone. Next week, I’ll provide an interpretation of how Nat Turner’s Revolt altered forever the Underground Railroad in Indiana. Rescue at Pine Ridge is the story of the rescue of the famed 7th Cavalry by the 9th Cavalry Buffalo Soldiers. The 7th Cavalry was entrapped again after the Little Big Horn Massacre, fourteen years later, the day after the Wounded Knee Massacre. If it wasn’t for the 9th Cavalry Buffalo Soldiers, there would of been a second massacre of the 7th Cavalry. This story is about, brutality, compassion, reprisal, bravery, heroism, redemption and gallantry. Hey David, thank you so much for sharing this information. Back when I was in ungrad and grad school, the slave revolts were a great interest of mine(still are)and I took a look back then concerning, Turner, Vesey and Posser’s slave revolts and wondered about their religious stance concerning their approach to these revolts. Information and particulary religious information would have been limited, since most slaves had limited ability to read, and most what was heared was either biased based, “slaves obey your masters”, or some other nonsense they were told about God and the Bible, to make slaves believe that God had ordained their circumstances. Since “meeting” you, I have gone back and pulled out all my books and notes concerning the Slaves Revolts from this time period. 181 years ago today, Nat Turner scared the “crap” out the whites in Virginia! Both Vesey’s and Posser’s attempt at a slave revolt is an intresting chapter in African American History as well, and I have also been reading the current historiography concerning Vesey may not have plotted this plan revolt at all. I will plan to visit Guilford College, in fact I will get in touch with the Archivist ahead of time to let him or her know what I am looking for and get some assistance, again thanks, and let’s keep this blog going and I will give feedback when I return from the conference. Hey David, let me see if I am understanding this: After Nat Turner’s Revolt,other nearby States began to inact new laws which required newly freed slaves to leave the state within 90 days? So I am assuming that these newly freed slaves went to Indiana and help to start or continue the Undergroung Railroad? I am asking all of this for two reasons: First, you sparked my reintrest in Nat Turner, and secondly, I will attending a African American Genealogy Conference in Greensboro, NC in October and I want to research this when I arrive, so I thank you for this information, it’s a big help when I attend this conference to be able to shed some light on a this. Hi Marie, you do, in fact, have a correct understanding. North Carolina wrote a new constitution in 1835 and provided that newly freed African-Americans leave the state within 90 days of manumission. North Carolina, like Virginia, did not have the same agricultural profile as states in the Deep South, so support for slavery wasn’t nearly as strong. However, fear of another slave revolt was still strong and white were fearful of the very presence of free blacks as a source for inspiration among slaves. Turner, of course, wasn’t a free person of color, but Denmark Vessey, a former slave who purchased his freedom and then allegedly planned a slave revolt in Charleston, South Carolina in 1822. Vesey was betrayed, tried and executed, along with 34 other”conspirators,” (some doubt exists as to the extent or even existence of a plan to revolt), but white hysteria over the potential of a slave revolt was very real, hence North Carolina’s constitutional provision. Guilford County, N.C., of which Greensboro is the county seat, was home to Levi and Catherine (White) Coffin. With its large Quaker population, that area played an indispensable role in facilitating the migration of free persons of color to Indiana as you’ll read in tomorrow’s post. I suspect that you’ll strike gold in your research efforts, so don’t forget to visit the archivist at Guilford College who can undoubtedly shed plenty of light on African-American genealogy. Thank you so much for your comments and questions on my blog! I enthusiastically invite you to share on this blog your accounts of this October’s research venture. Hey David Mark Thomas, Remember me? I have reply to you through our other link-up, but now I have come on your website. You sparked a re-interest in Nat Turner at least with me you have, and you have caused me to take another look at why neither Nat Turner or any of the others insurrectionist, Gabriel Prosser, or Denmark Vesey are not so talked about, in any history for that matter. And why did these individuals approach “deliverence” from slavery from a religious perspective. Others, such as Harriet Tubman also “implied” that she too heard from God about Blacks deliverance from slavery. I find this an interesting theory. Which I intend to explore. But you also mention how Nat Turner’s revolt altered the Underground Railroad effort in Indiana. I can’t wait to read your comments on how Nat Turner’s Revolt in Virginia effected the Underground Railroad operations in Indiana. Take Care! Thank you so much for your thoughtful comment, J. Marie! Yes, I absolutely recall our exchange on LinkedIn, which has been a fabulous source for the best comments on my young blog. 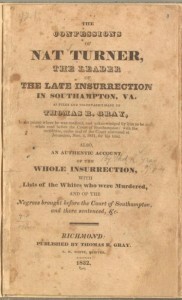 One of the resulting types of law enacted as a direct response to Turner’s insurrection was banning the teaching of African-Americans to read. 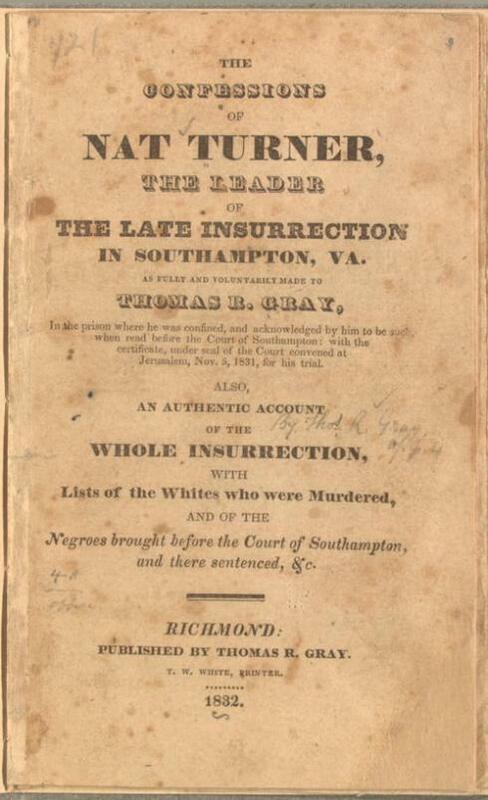 Two factors drove that trend, one being the Southhampton revolt, (Turner’s), and the other being the introduction of The Liberator, William Lloyd Garrison’s fiery abolition pamphlet demanding immediate, uncompensated emancipation of all slaves. Both the Bible and The Liberator offered encouragement to slaves to resist. Prior to 1831, such restrictions were uncommon. Regarding Indiana’s connection to the uprising, North Carolina’s re-written constitution of 1835, no doubt influenced by the fear of further slave revolts, provided that newly free blacks leave the state within 90 days of their manumission. As you’ll see in my next post, this act help populate Indiana with a new source of dedicated conductors on the Underground Railroad. Thank you again for commenting and do be generous in sharing this blog among your networks!